I thought since there is a lowest sirens thread why not have a high mounted sirens thread. Here is a whelen that looks to be pretty high up, as well as on a hill. The second Tbolt shot is great, silhouetted against the ominous clouds! Shot of the Week! Agreed. Very nice and artistic shot! I should have mentioned that second thunderbolt picture is Credit of WIBW.com I did not take the picture and do not claim copyright on it. This one in Battle Creek, MI is at least 20 floors up. Last edited by EL1998P71 on Fri Mar 28, 2008 2:24 am, edited 1 time in total. The highest siren I know of in Wichita is a single-tone Thunderbolt on top of the 13th floor of the AT&T building. The last Chrysler in Kansas City is about 13 storys up AND on a 1 story high tower. 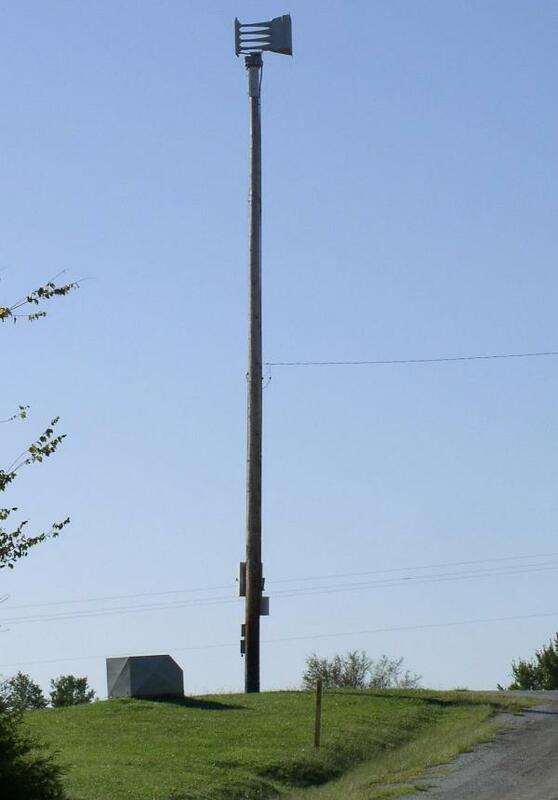 There's also a Whelen 3016 outside Tulsa, Oklahoma behind a Quik Trip that seems to be mounted on a four or five story pole, but I've yet to get pictures of it. This siren isn't mounted that high, but I felt it deserved an honorable mention considering the pole is falling backwards. Eventually I guess that siren will develop rotator problems or collapse. Is that a railraod track in the photo? Since I could not get a good vantage point from any direction it is not easily seen. We even went to the top of a parking garage and could not get a good shot. If you click on this link then full size for the pic you can see it much more clearly. The roof level of that building is 18 stories, the siren is technically on the 19th because it's on top of the elevator maintenance room.